Summer is beginning to look like a distant memory at this time. 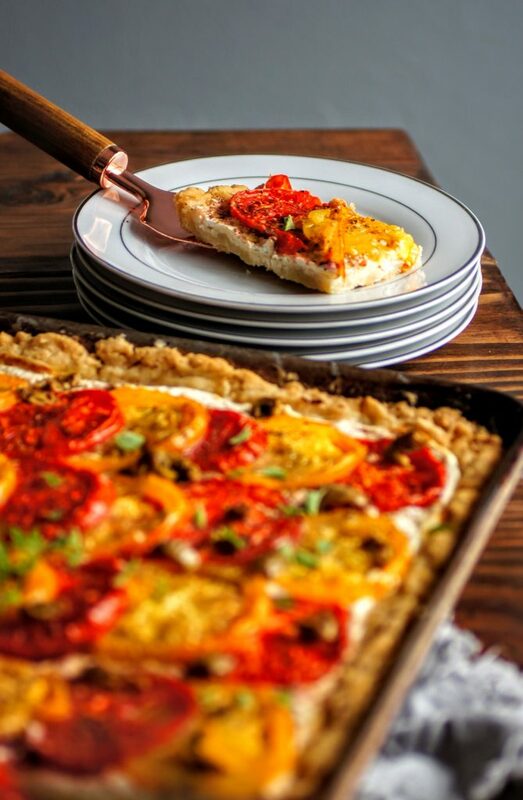 But if you’re like me and have a few lingering tomatoes on your vines or can still find some beautiful ones at the Farmer’s Market, this tomato pie won’t disappoint. 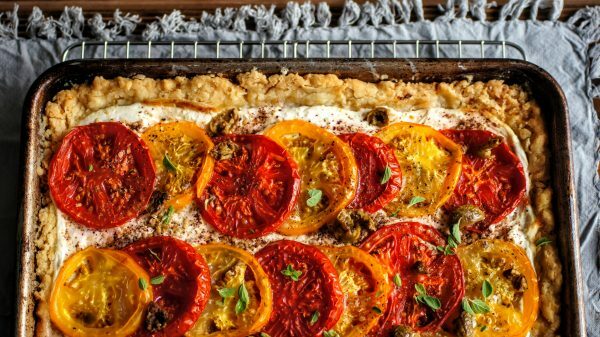 Traditional slab pie style made savory and with a Lebanese twist. If you know anything about me, you probably know that one of my all time favorite foods is manousheh, basically a Lebanese oregano/thyme pizza, topped with zaatar. Manousheh is really a blank canvas like a pizza to add all your favorite goodies. Mine include: lebneh, olives, tomatoes and mint. 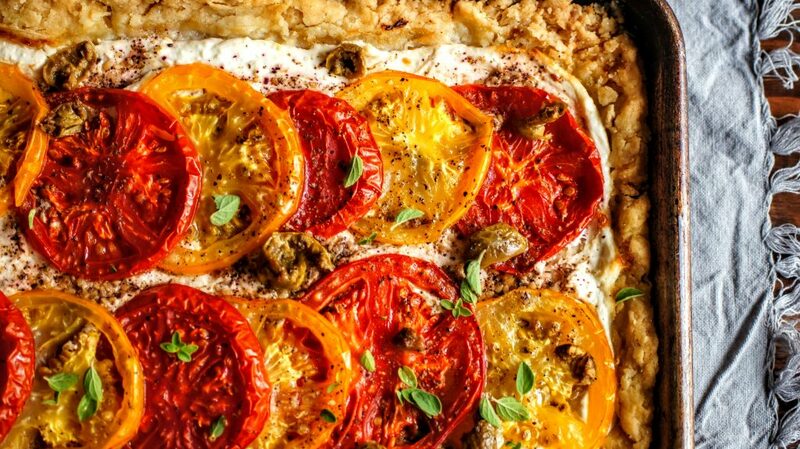 Since I had so many tomatoes on hand, I wanted to make a manousheh inspired tomato pie. A little bit country + a little bit Lebanese. Zaatar is the base of manousheh, zaatar is widely available at middle eastern stores premixed, you can also find it Amazon pretty inexpensively. It is a blend of sumac, oregano, thyme and sesame seeds. It is extremely aromatic and so delicious. If I purchase a pre-mixed variety I often add to it to enhance the flavor: add in some extra sumac (which gives it a lemony flavor), some salt, some additional toasted sesame seeds, dried oregano. A little enhancement makes a world of difference! It just gives it a bit of an umpf. I’m currently a bit spoiled and using a mix my dad made for me with herbs directly from Lebanon, it’s basically heaven in a bag. Lebneh is the sour cream of Lebanon. It is a staple ingredient and at every dinner and breakfast. Homemade tart yogurt. In America all our yogurts are sweetened but in Lebanon yogurt is enjoyed in its truest, simplest form. Drizzled with olive oil, some dried mint and pita bread, it’s an amazing dip. Making lebneh is pretty easy, some milk and a yogurt start and heat, you’ll have delicious homemade lebneh (I will have a step by step post soon). Most natural food stores or international grocery stores will carry it as well. You can also sub Greek yogurt, which is very similar. Lebneh tends to be slightly more tart and tangy than Greek yogurt. So now all these amazing ingredients put together into a pie with fresh tomatoes seemed like a great idea. Check out the steps below and as always, I hope you enjoy. I love to see your creations, tag me on Instagram @CosettesKitchen or post on my Facebook Page. Using a half sheet pan, roll out your pie dough to fit into a thin crust, press sides up to create an edge. Place in fridge to remain cold while you prepare the rest of your ingredients. Slice your tomatoes about 1/4" thick, lay on another empty sheet pan and sprinkle with salt to remove excess moisture. Let sit for about 10 minutes. In a medium bowl, combine your lebneh, lemon zest and a few grinds of pepper. Remove your pie dough from the fridge and spread your lebneh mixture onto the prepared crust. Sprinkle the top of the lebneh with about 2 tablespoons of your zaatar mixture, making sure to cover the entire pie. Pat your tomato slices dry with some paper towels and being laying them on top of your lebneh mixture in any arrangement you find appealing. I liked layering slightly and using 2 different colored tomatoes gave it a pop! Finally, sprinkle the top of the tomatoes with the last tablespoon of zaatar, a few grinds of pepper and several pitted green olives. Bake for 30-45 minutes rotating the tray from top to bottom halfway through, cover edges if they are browning too quickly. Remove, sprinkle fresh oregano, let cool slightly. Slice and enjoy!